Discussion in 'Amps and Cabs' started by heady dude, Mar 1, 2008. Im sure this has been covered on here before, but I want to hear what people have to say before I pull the trigger on a 2k amp. 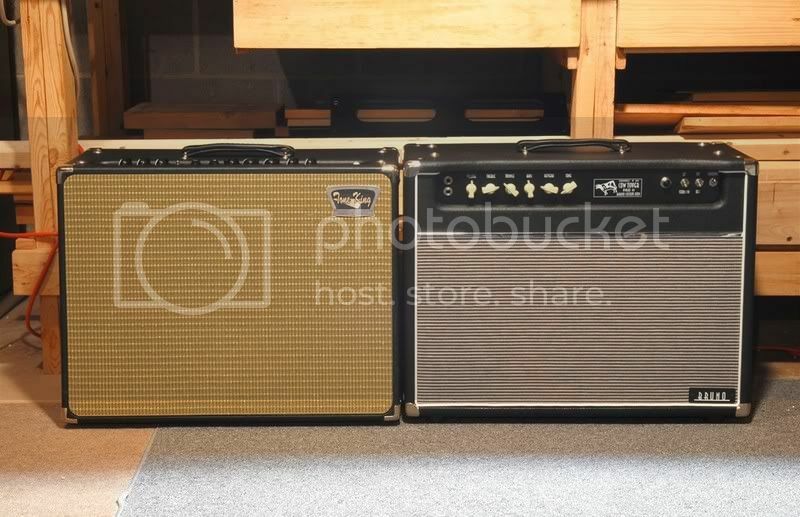 Theres really so much you can get from a clip and you really need to play an amp to get feel for it, so Ive been thinking bout getting a used Bruno to A/B them to hear it for myself. Ive got a Meteor 2 and love it, some of the best cleans Ive ever heard in person. From what I hear the Brunos cleans are a good bit better, but is it really night and day between the two? I mean I would be paying more for the Bruno and be giving up the tweed channel and the trem. I'm just a hobby player who hasn't been playing all that long, and the meteor is by far the nicest amp Ive owned, so Im wondering if my ears will even hear a huge difference or not. Ever since I found this place my wallet just keeps getting smaller and my tone just keeps getting better. I haven't heard any cleans that I like more than in my Tone King Meteor II. Since you already have a Tone King keep it and buy a Bruno too. I had MII and CT35 1x12's at the same time. Both are certainly very fine amps, but the MII worked better for me in my band (blues-pop-rock). Try this thread for a start. Search a bunch, there are some good threads about this very topic. I have owned a Meteor II for a year and a half, and it has bumped some nice amps to the curb at my place. I have not tried a Bruno yet, but I'm not very motivated since having the Tone King. I think it's hair splitting at this point. Is there something the Tone King is not giving you? really want to check one out! Great advise Tag! You could probably make all your amps sound good. To a large degree its in the hands, unless the amp is a downright dog. Riff-Thats a sweet site for sure. JR-You are right this is hair splitting, and no I love my TK its great, and the more I play it the more I like it. JJ- Yea your amp is why I started this thread. Thats a pretty good price you got on it as well. Tag- I was hoping you would stop by, even though I pretty much knew exactly what you were going to say See you have been one of the main reasons I have even thought about switching up my MII. Ive heard your clips and heard you go on about the CT on here, and I must say, you sold me. I dont agree with you about the DRRI though. I used to have the 65 RI, then one day a played a TK. I sold the RI that week, and bought a MII. It was no contest to my ears, the TK made my 65 sound flat, thin, and trebly(Ice picky). Even though it is a great amp, the TK ate it for lunch. Maybe with a speaker change, and some PTP wiring it would have been more of a contest, but stock, no way. Anyway I really dig your playing and tone. Keep on pickin. I wish I was kidding, well my bank account does anyway.